When it comes to sniping in the US Military, the USMC is usually the first branch of the military that comes to mind, and rightly so. Without questions, the Marines have lead the way for the development of sniping in the United States. But the US Army has made great strides in their incorporation, equipping, training and use of snipers over the past several decades. They have progressed to the point where today, along with the Marines, they are considered to have some of the best snipers in the world. That certainly was not always been the case. A large part of this recent excellent reputation is due to the US Army Sniper School located at Ft. Benning Georgia. We wanted to take the opportunity to provide some of our own commentary based on our experiences with the US Army sniper school. You will not see a lot of photos in this write-up primarily because I did not take any photos while I attended the school for fear I would jinx the course and fail. The failure rate was so high that you were never really sure if you were going to pass or not. The pictures you see here were ones lifted from the internet that show a little of what it was like when I attended. It has been well documented by many sources on how snipers were never really considered a permanent, or necessary, part of the US Military in the first half of the 20th century. But as the need for snipers kept manifesting itself each time the United States found itself in some sort of conflict, the various branches began to change their view on incorporating snipers permanently. During the Vietnam War the 9th Infantry Division Sniper School located in Vietnam went a long way to providing a foundation on which the US Army could build their program. Unfortunately, snipers were once again discarded after the war ended and their M21 sniper rifles were packed away. This time though, the USMC finally took the initiative and started a permanent sniper program after the Vietnam War, and the US Army was watching. The use of USMC snipers proved effective in low intensity conflicts in the 70’s and 80’s, and the US Army finally caught on and in the second half of the 1980s they decided to start their own permanent sniper program. The use of snipers was viewed differently in the Army than it was in the USMC. In the heart of the cold war, the Army considered their armored battalions their main source of power and their view of snipers was just a way of enhancing the effectiveness of their dismounted squads, almost like the Designated Marksmen role. Fortunately, there were some true believers in the light infantry concept and the need for flexible infantry battalions that were not mechanized. Those units really took the benefits of snipers to heart and used them to their full potential. In the 1990s, the organization of snipers in a Mechanized unit consisted of a single two man sniper team per Company that was attached as a part of the HQ Platoon. It worked okay. The light infantry units did it differently, they had a squad of snipers as a part of a Battalion Scout Platoon. This proved to be the more effective and flexible way of organizing them. As the global War on Terror took over, the need for effective light infantry units and flexible sniper teams became very apparent and where possible, the Mechanized units switched over to the same type of organization of their snipers as the light infantry units. With the effective use of snipers becoming much more common, the Army has advanced their doctrines forward and are now utilizing their snipers properly versus their old way of thinking that originated from the tanker mentality of the Cold War. As the Army began their incorporation of snipers as a fixed part of their infantry units, they not only had to come up with a new sniper weapon system, the M24, but they had to devise a means of training their new sniper corp. 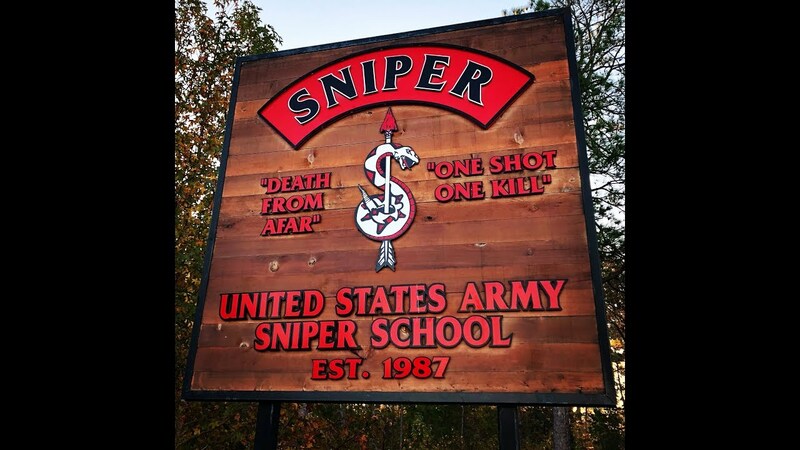 The doors opened on the newly formed United States Army Sniper School in 1987 at Fort Benning Georgia. Ft. Benning is known as “The Home of the Infantry” and is where nearly all of the infantry specific schools are located, so it was a natural place for the Sniper School. The school initially was located at Harmony Church and it still was when I went through it in 1997. This is near where the 4th Ranger Training Brigade (RTB) is located and the school shared the chow hall with all the Ranger School students. Initially the US Army Sniper School (USASS) was only three weeks long and taught the curriculum out of TC23-14 (TC = Training Curriculum). It was a lot to try and cram the basics of sniping into a three week school, but they did the best they could. Enrollment was limited to 11 series Military Occupational Specialties (MOS), which was the infantry, and 18 series (Special Forces). If you were not infantry or SF, you could not attend the school. To qualify for entrance, a soldier had to have qualified expert with the M16, score a 210 (with a 70 in each of the three events) on the PT test, pass a psyche evaluation, have scored a 110 on the GT portion of the ASVAAB, not be color blind, have correctable 20/20 vision, and be at least an E-3 promotable (typically E-4) or higher rank. 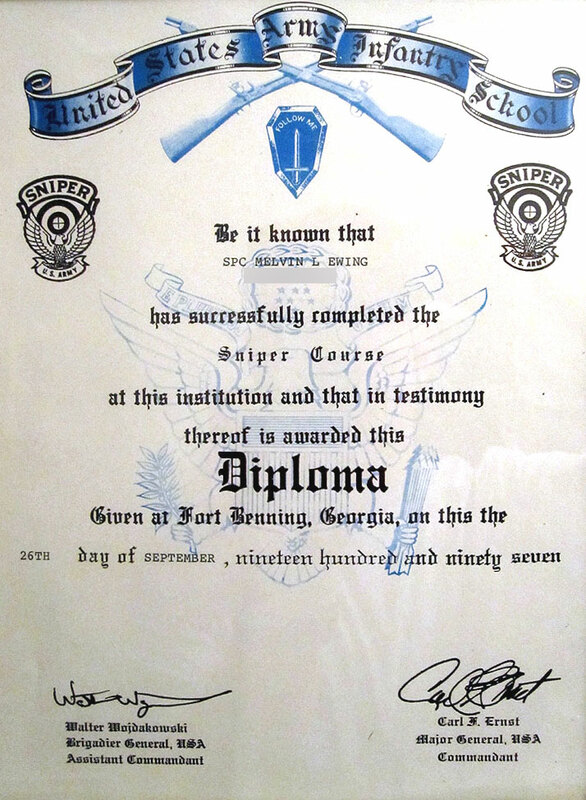 If a student graduated, they received the coveted B4 identifier on their MOS which signified them as a trained and qualified sniper. The Marines refer to this as a HOG, or Hunter Of Gunmen. This had not yet caught on in the Army when I was in. As the school progressed through those early years and the training evolved, it became evident that 3 weeks was not enough time and the school was lengthened in the mid 1990’s to 5 weeks. Additionally, sometime during these early years a new sniper manual was written and published by the US Army. This manual was FM23-10 (FM = Field Manual) and it greatly expanded on the basics of TC23-14 and included sections on the M24. With the school now 5 weeks long it allowed them to cover most, if not all, of the same material as what the USMC schools taught and many of the USASS instructors went through the USMC Sniper Instructors course during these years, and likely still do. Finally, the last major change happened to the USASS in the early 2000s when the global War on Terror was in full swing (it still is) and there was a discovered need for much more elaborate training on urban (MOUT) sniper operations. An additional two weeks were added again, making the school 7 weeks long now. Additionally, the MOS 19D (Cavalry Scout) was now allowed to attend, and yes another new field manual was published, refined even further and with restricted in distribution (finally), and is known as FM 3-22. Still to this day, the B4 is awarded only to graduates of the USASS and it is one of the hardest classes to pass in the US Army. The average pass rate for the USASS is about 40% and the school is known to produce excellent snipers. 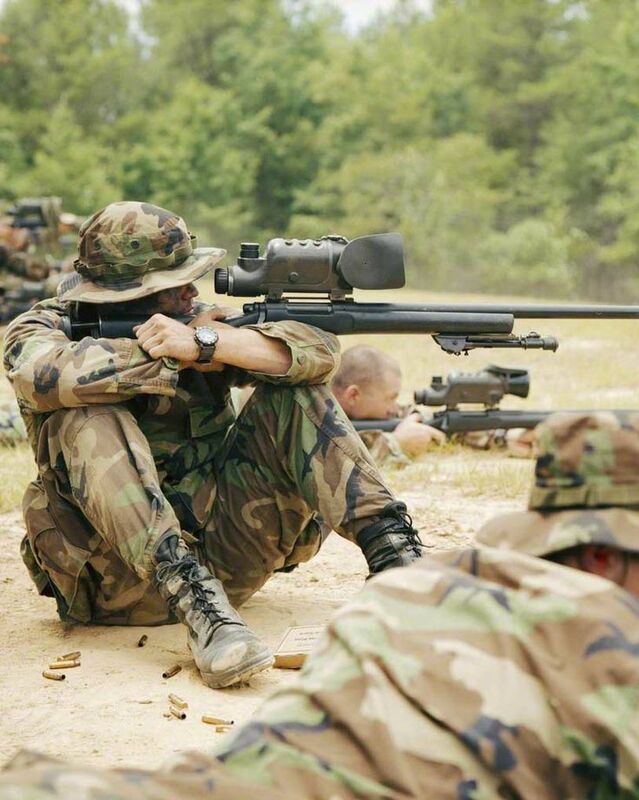 I went through the US Army Sniper School at Ft. Benning in 1997 when the school was five weeks long. At that period of time there were only about 6 classes a year with around 24 students per class, so the number of sniper grads, considering the 40% graduation rate, was small. The classes tended to fill up fast and we had to reserve my slot about a 9 month ahead of time. The class I attended was held in August and September of 1997… and as is the norm for Ft. Benning, it was hot and humid. Because the standards are high and the class difficult, there was no gentle indoctrination. All of your paperwork had to be complete and correct when you got there and on Day 0 there was a PT Test. You scored a 70+ in each of the three categories, or you went home. It was always a shock to the system going from cool and crisp Montana air to the hot and muggy Georgia jungle. After a brief scare during the 2 mile run, I passed and the class begun in earnest, and I mean in earnest! That first week was unbelievably busy. That first week of class set the tone for the rest of the school. The classroom work began on the first day and carried through the entire week, covering topics such as the M24, different types of ballistics, firing positions, and many more of the basic fieldcraft and marksmanship topics. But it was not just classroom work. Time on the range began with verifying known distance data versus what was on our BDC knobs on the Leupold M3A scope as well as continued long range marksmanship training. The thing that really killed us that first week was the knowledge that we had a ghillie suit inspection on Friday morning. The problem was, there was NO allotted time for ghillie suit construction. There was just not enough time in those 5 weeks to cover the required instruction AND provide time for ghillie construction. Another assumed reason for no allotted time was to introduce more stress in the school. With the days filled with classroom work, shooting and other training, the only time left to work on the ghillie was after evening chow through wakeup the next morning at 5am. Building a ghillie for the first time meant we were slower than normal as we learned the ins and outs, and sleep deprivation was real. Most students probably averaged about 2 hours of sleep per night that first week until that Friday morning ghillie inspection. The inspection itself was real fun, or not. 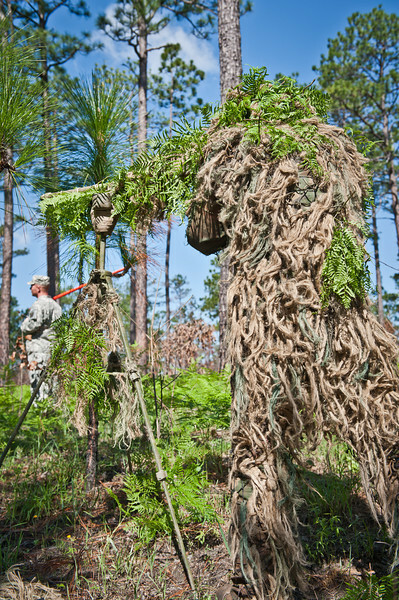 It happened on the morning of our first stalking exercise, and to drive the point home they pointed out flaws in our ghillie suits by using florescent orange spray paint. It worked. That Friday started the stalking phase of the school. The school consisted of four main skills that were tested and and considered critical skills. Marksmanship, Stalking, Range Estimation and Target Detection. Those four main skills were tested extensively with mandatory minimums and overall averages are required. The US Army school was patterned after the USMC school and much of the same training and testing was conducted. As mentioned already, the training cadre routinely would go through the USMC Scout Sniper School as well as their Sniper Instructor course to insure standards and techniques were kept current. As is the case in perhaps all of the main military sniper schools, stalking tends to be the number one event that fails the most students, and for good reason. It is difficult. At the US Army school, the second leading cause of failure is target detection. For me personally, target detection was a challenge, but stalking was quiet fun and I was able to pick it up quickly due to a couple of tidbits some of the instructors gave me on our first practice stalk. From there, it came naturally and I came from Montana where hunting is a part of life. That certainly helps, but stalking can be taught and learned, and often it is. The stalking was actually a break for me. It gave us 4 or more hours of quiet time! You see, the USMC and US Army share the same view that sniper school is NOT a gentleman’s course and you are routinely smoked and punished for legitimate reasons, and then of course for dumb reasons. The idea is to put as much stress on the students as possible to insure they can perform when the going gets tough, and they made it tough. I do not believe they have changed this philosophy and it is still used today. Some of the instructors actually told us they believed it should be a gentleman’s course because learning it was so darn difficult. Several of the very elite Special Operations sniper schools are gentleman’s courses, and it is likely a wise choice, especially in the special operations groups as those guys are legit and do not need any more smoking. They have proved themselves in operations, BUD/S, Q-Course, Ranger School and others. But for the grunt sniper schools, I can see the argument both ways, I just know it wasn’t very fun going through it and they incorporated smoking us into everything! KIMS games were a constant smoke session that I would prefer not to remember. The graded portion of marksmanship included unknown distance shooting from 300-1000 meters and moving targets from 300-700 yards. Because the known distance shooting was done on old establish ranges, the movers were in yards. The newer sniper ranges were all in meters, as were our scopes. We also did stress fires that included lots of running and exercise as well as lots of smoke, flash bangs and other good stuff. We did unconventional shooting positions and familiarization with night vision and the M107A1 SASR (Barrett .50 BMG), though it was an M82 back then and not yet officially adopted. The instructor cadre, like most every school, was a mixed bag. There were many good instructors, a few horrible instructors, and a few fantastic instructors. As a whole, they were very good and they knew their material very well. There were two instructors that I would say were some of the best I have ever had in any school. They genuinely wanted you to succeed and they would spend extra time with struggling students to help. Most of the instructors provided good feedback during training and testing, but the great ones did even more. They were also the ones that you could tell were enthusiasts and master snipers. They lived and breathed the stuff and were always doing what they could to make the training and the school better. The facilities at the school, at least when I went through, were also a mixed bag. The ranges were great. There were several different lanes on the unknown distance ranges with targets beyond 1000 meters, even out to nearly 1200. The known distance ranges were quality competition ranges from 100-1000 yards. The classroom was old school and the barracks were REALLY old school and run down, but it all worked. They have since moved into their own newer facility and have torn down all those old barracks. As I understand it, the new facilities are much nicer, though I have not had the opportunity to visit in person as of yet. I believe it is still near the 4th RTB and Harmony Church, but I am not positive. The class culminated with a three day FTX that involved everything we learned through the five week school. We had to covertly move to an objective, stalk, engage a target with live rounds as a team, perform observations with a log and sketch, and many other sniper related tasks. During the five week school we had many other classes that were taught about various topics and we used all of that training during the FTX. These classes included topics such as tracking, E&E, sketches, patrol logs, survival, urban sniper operations and others. They did not teach some of the basic soldiering fundamentals that are taught in other schools and training as you are expected to know them as a standard E-4 infantryman. These were things like call for fire, operation orders, and those types of skills. They taught you the sniping skills and you were expected to go back and sure up your basic infantry skills to complement what was needed for being an effective sniper team. I liked that approach. At the end of the FTX is the dreaded final shot. This consisted of an unknown distance engagement typically from 600-800 meters (655-875 yards). This shot is done without the aid of your spotter and you had to make the range estimation, wind call, weather call… essentially everything. You had two shots to hit the target, or you failed the entire school. No re-fires. And you only had 2 minutes. Did I mention that they try to put pressure on you during the school? If you missed with your first round, the instructor who was spotting would tell you where you missed, and that was it. I ranged my target at 680 meters (743 yards) using the mil-dots and dialed in 3 MOA of left wind. (Yep, I still remember the details, stress will do that). My first round went over his left shoulder (meaning I was up and right slightly). I came down two MOA and left another one. Second round gut shot him. I passed. Sniper School for me was one of those things that was miserable when experiencing it, but then once you passed it and are heading home, you think “Yeah, that was pretty legit.” Of the 25 students we started with, 14 of us passed. Slightly more than 50% and better than average. We had eight guys from Ranger Battalions and a RIP instructor as well as guys from 10th Mountain, 25th Light, and other high speed units. As is normal in difficult schools, camaraderie and brotherhood typically form fast and we did what we could to help each other out. I was the only National Guard guy in the school, perhaps my weakness, but I had a degree in Mathematics so I was able to help a lot of guys out with the technical stuff like range-e and the ballistics. By the end, I was just one of the guys and felt accepted, guess I earned it? Some do not hold the US Army school in as high of regard as the USMC school, and I understand why. But the Army school is patterned after the USMC school and the standards are just as high and it has produced some excellent snipers. Now the school is two weeks longer than when I went through and includes some of its own unique aspects including an in depth portion on urban operations, something that we only got a single day of instruction on. I consider the school to be in the upper tier of military sniper schools and it holds its own when compared to the others. It obviously is not on par with the special operations schools that are out there, as that is not the purpose or goal of the school. All in all, a great school and I am honored to have attended, and grateful I passed! Interesting article. Congrats by the way! One of the reasons I like being a member of SC, you guys are the real deal. Thank you for your service and your knowledge. I hated ft benning….congrats on the school , no way I could have made it. I hate the heat and need my sleep LOL, I fell asleep walking a gaurd post once. Heh, I hope that ended okay! I use to belong to the Ft Benning gun club when Mr. Johns was over it. I remember seeing those old barracks and I wondered if those were the same ones my dad used during basic before going over to Vietnam. They closed the old range and opened up a new one. You can still see the Sniper school sign from hwy 27 . I see it on the way to another range. I’m just curious do you still say things like 5 plus one when dialing your dope? I know a Army Sniper on Youtube still thinks in terms of Leupold custom dial. Hey, thanks for the memories!! Questions on graduation from sniper school. My boyfriend is entering sniper school and I am wondering what time graduation usually is on the Friday of the 7th week, and what I should expect. I this graduation open to family and loved ones? I know it’s not a guaranteed graduation, but still curious. Thanks! That is a good questions. Normally the graduation is late morning (at least it was when I went through) and yes, it is open to family and friends. He should have more details as he progresses through the class. When I graduated in 2012, there wasn’t a graduation ceremony, so therefore family was not welcome. It was basically you passed or you didn’t, now go away.